or as a Paperback book, available on Amazon.com, by May 25th. $9.96 PDF download, 160 pages, 1.2 MB. 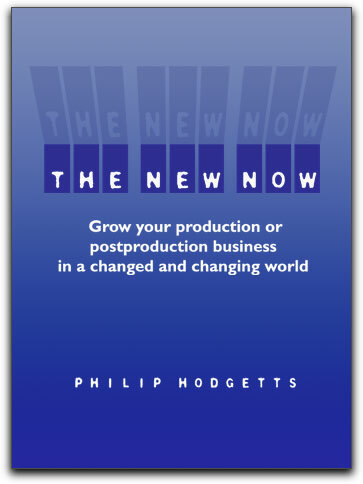 Philip Hodgett's new book "The New Now" is an informed, thoughtful, well-written and info-packed look at marketing strategies for traditional video, film production and associated services for today's digital environment. It seamlessly blends old and true advice with the realities (and thus, opportunities) of today's digital world. It would help in growing anyone's business. I find it's very relevant to today's conditions, as well as a very forward thinking approach to the subject. It is fresh, new and well, NOW. Learn the new way of delivering your message, and reap the rewards. Not often do you get to read thoughts that are so relevant to today's marketing delivery systems. This book hits the nail on the head there, and it's written by a fellow who knows what he is talking about. Philip Hodgetts' well-known web sites, online news/talk shows have been around for a very long time now. His interviews with industry leaders and news hounding spirit keeps him well apprised of the cutting edge of our industry, and so his advice to business owners everywhere in our industry is likely to be well informed. It's worth the price of admission just to listen to what a fellow like this has to say. "The New Now" delivers. It gives sound advice on how to position your products and services in the new world of marketing that is turning our industry on its ear. The Internet's digital revolution is where the future of our industry lies. Because that is what this brave new digital world has become: The whole world market. Naturally, our digital businesses are affected to the extreme by this reality. And from my point of view, we're all in on the "ground floor" of this new reality in business. It's time to jump all over it in fact. Its timeliness couldn't be better either. The advice in this book could turn your business around completely, especially in today's economic situation. Even faced with a downturn, there are ideas in this book to make you and your business thrive in it. "The New Now" doesn't say to lower your prices! It tells you how to sell solutions, not your services. It even investigates the opportunities working distantly. The Internet has certainly made this possible. It's the wave of the future too I believe. I've been uploading cuts for changes/approvals for quite a while now, and this section was right on. Plus tips on how to find clients who like working remotely. It's written for freelancers as well as larger companies working anywhere in our growing and changing industry. It would even do well for the manufacturers of our equipment to read this book. It's really written for us all. Topics discussed include Working Smarter, Cutting costs, Marketing, PR and Social conversations. Philip even makes sure you know what your business really is and how to make it grow. Even includes a chapter on how to sell. It's great advice throughout. The shift is happening faster than we can keep up with, but Phillip keeps it all in perspective, with help from a multitude of directions, including why you should have a company blog. Branding and how it's done successfully. It's very plain to me that those who don't embrace the new situation we find ourselves in won't reap the benefits of the new business models outlined in "The New Now". Philip blends old tried and true marketing strategies and brings them into the new now. I couldn't stop reading once I started. It even has further links within it to hundreds of Internet sites for further reading, a data base of EVERY article ever written on many many subjects and hundreds more, all relevant to the conversation of marketing in today's changing world. Marketing advice like this should cost thousands, and it's yours for only $9.95? Every reader will gain something from the narrative here, and it's kudos to Philip Hodgetts for the effort and generous information with tips all the way through that are simply terrific. "Get used to living in a world where change is the new constant where most of the rules of engagement in business, with customers and the wider world are constantly changing. If you've stayed in the production or postproduction business for more than a few years, you'lre already weathered significant change." The 200+ links are worth the $9.95. I can't recommend it more. It's a must read.